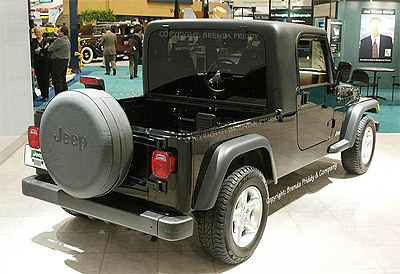 The sign next to the Jeep Scrambler at the recent NADA convention simply said "engineering concept", but the display also stated "2005 (model year) PRODUCTION SCRAMBLER WILL HAVE"
It was a soft announcement, but there is no doubt about it - the Scrambler will arrive next summer as a 2005 model. And it will look VERY much like this concept! This engineering concept has a 19-inch stretched wheelbase, but the actual production model will be stretched far less - only ten inches as stated on Jeep's very own display, with a five-inch overhang stretch. But sources are now telling us that there may be both long- and short-wheelbase versions. The bed itself will measure in at approximately four feet, and the Scrambler will be powered by a four-cylinder engine, with an in-line six option. The Scrambler concept shown here has a removable top, but others have spied a soft-top version as well. 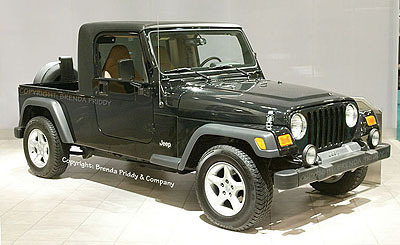 The Toledo, Ohio-built Scrambler will be produced in limited numbers of about 20,000 units per year for the 2005 Jeep Scrambler. * 147hp 2.4 liter 4cyl. * 190hp 3.7 liter 6cyl.